Today’s conventional prosthetic limbs do not provide feedback to the nervous system. Because of this, people with amputated limbs cannot feel the position, speed, and torque of their prosthetic joints without looking at them, making it difficult to control their movement. In order to create a more complete prosthetic control experience, researchers at the Center for Extreme Bionics at the MIT Media Lab invented the agonist-antagonist myoneural interface (AMI). The AMI is a method to restore proprioception to persons with amputation. 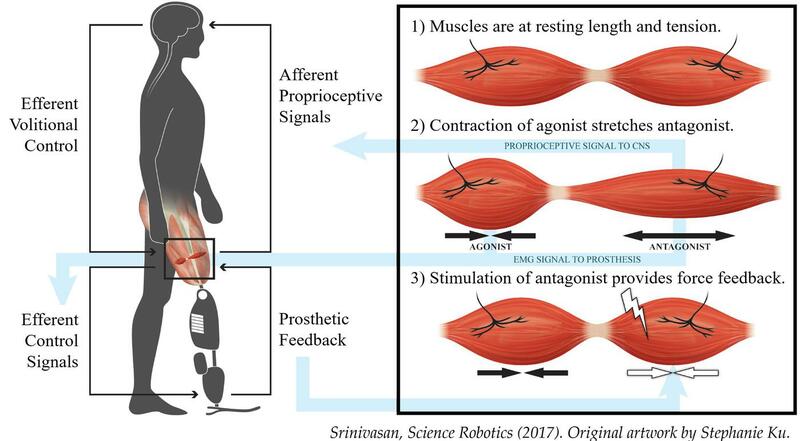 Proprioception in people with intact biological limbs is mediated by biological sensors in muscles acting in opposition to each other in relation to a single joint. To replicate this feedback in an amputated residuum, an AMI is made up of two muscles – an agonist and an antagonist – connected mechanically; when the agonist contracts, the antagonist is stretched, and vice versa. The purpose of an AMI is to control and interpret proprioceptive feedback from a bionic joint. During an amputation procedure, a surgeon creates AMIs by linking together muscle pairs within the amputated residuum. Multiple AMI muscle pairs can be created for the control and sensation of multiple prosthetic joints. Artificial muscle electrodes placed over each AMI muscle communicate with small computers within an advanced bionic limb that control movement of the bionic joints. As the bionic limb moves, the AMIs enable a person with limb amputation to feel its positions and movements. The AMI was validated in extensive pre-clinical experimentation at MIT, prior to surgical implementation in a human patient at Brigham and Women’s Faulkner Hospital and bionic implementation at MIT. In the first human implementation of the AMI, discussed in a paper recently published in Science Translational Medicine (May 30, 2018), we surgically constructed two AMIs within the residual limb of a patient at the time of his below-knee amputation. Each AMI sends control signals to one joint of a robotic ankle-foot prosthesis, and provides proprioceptive information pertaining to the movement of that joint back to the patient’s central nervous system. When the patient moves his phantom limb, the re-connected muscles move naturally in dynamic pairs, sending proprioceptive information through nerves to his brain. He consequently experiences natural sensations of ankle-foot positions and movements even when blindfolded. This AMI patient has better intentional control over movement of a bionic prosthesis, compared to a group of patients with traditional amputation. In addition, when he walks up and down stairs all the natural movement patterns mediated by the central nervous system emerge through his synthetic limb as an involuntary, reflexive behavior. In these trials, the intricacies of natural foot placement during stair ascent and descent emerged before our eyes, without the patient consciously trying to move his bionic limb. Furthermore, we describe the first-ever system for closed-loop joint control with natural neural feedback of prosthetic joint torque, and show that this system improves function. When walking up stairs, the natural movement patterns mediated by the central nervous system emerged through Jim's synthetic limb as an involuntary, reflexive behavior. Jim was not consciously trying to move his bionic limb. In addition to these functional improvements, the AMI patient also moves and behaves as though the bionic limb is part of him. After a few minutes of wearing it for the first time, we asked the patient to describe his relationship with the device, and he said, “The robot became part of me.” Because the patient’s nervous system was connected to the prosthesis in a bi-directional manner, neurological embodiment was achieved. This is an example of a design paradigm that we call NeuroEmbodied Design. In this design process, the designer designs human flesh and bone–the biological body itself–along with synthetics, to enhance bi-directional communication between a human’s nervous system and the built world. “Previously humans have used technology in a tool-like fashion,” senior author and project director Professor Hugh Herr says. “We are now starting to see a new era of human-device interaction, of full neurological embodiment, in which what we design becomes truly part of us, part of our identity.” We see a future in which our designed world will be carefully integrated within our nature: a world in which what is biological and what is not, what is human and what is not, what is nature and what is not, will be forever blurred. Jim Ewing moves and behaves as though the synthetic limb is part of him; when he accidentally steps on a roll of electrical tape with his bionic shoe, he responds in a natural way by shaking the tape loose. Jim Ewing, the first patient to undergo an AMI procedure, was injured several years ago while rock climbing in the Cayman Islands. The surgical operation he underwent, in which AMIs were implemented from native muscles at the time of below-knee amputation, was named the "Ewing Amputation" in his honor. Rebuilt as a cyborg, Jim returned to the Caymans to climb once again.